A Gershon Fox Ballroom Wedding takes place within the historic walls of the G. Fox and Co. Building in Hartford, Connecticut. The G. Fox and Co. Building is notable for its architecture and historical relevance. The eleven story structure was completed in 1918 and has stood soundly on Main Street in Hartford ever since. G. Fox and Co. was developed as a Neo-Classical style building that included monumental Corinthian marble columns. The building is also filled with elegant art deco design and it has a refined old Hollywood ambiance. Today, G. Fox and Co. is now managed by Marquee Events, who are the exclusive hosts of the Gershon Fox Ballroom and the Mezzanine lounge. In this image, the bride and groom at a Gershon Fox Ballroom Wedding stand at their ceremony with the flower girl between them. The photo focuses on the details of the bride’s gown -- a beautiful ivory dress with intricate flower designs swirling up and down the satin fabric. The bride’s bouquet is neutral, filled with white and pale pink flowers. 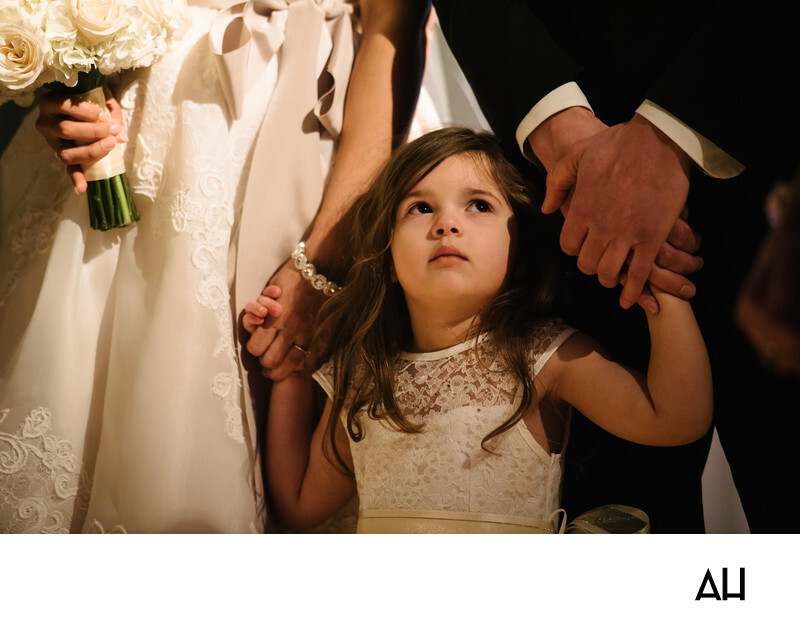 Next to her, the young flower girl holds her hand and the hand of the groom. The flower girl looks up at the scene before her, eyes full of wonder. She wears a dainty, white flower girl dress. Her hair was curled earlier in the day, but it already has gotten a little bit messy in the way that a small child’s hair does. It has been a wonderful day for all involved in the nuptials thus far and the magic will only continue as the couple moves forward.